Exmouth is a town on the tip of the North West Cape in Western Australia. Explore hidden gems such as Scuba & Snorkeling and Ningaloo Reef. Escape the urban bustle at Fishing Charters & Tours and Shothole Canyon. 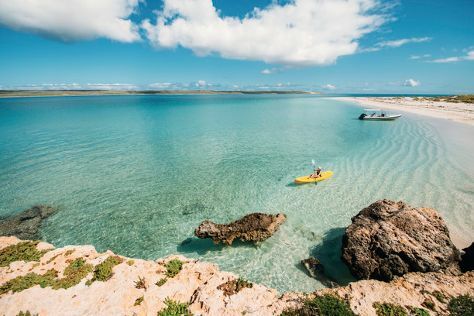 There's lots more to do: explore the wealth of natural beauty at Cape Range National Park, take in the exciting artwork at The Ningaloo Gallery, steep yourself in history at Potshot Memorial, and look for all kinds of wild species at Ningaloo Coast World Heritage Area. To see photos, traveler tips, and tourist information, use the Exmouth day trip planning site . Brisbane to Exmouth is an approximately 14-hour combination of flight and car. You can also fly; or drive. You'll gain 2 hours traveling from Brisbane to Exmouth due to the time zone difference. Expect a bit warmer weather when traveling from Brisbane in August: highs in Exmouth hover around 31°C, while lows dip to 13°C. Cap off your sightseeing on the 16th (Fri) early enough to go by car to Denham. Denham is the administrative town for the Shire of Shark Bay, Western Australia. Kick off your visit on the 17th (Sat): go for a stroll along the water at Shark Bay, then take some stellar pictures from Eagle Bluff, and then enjoy the sand and surf at Little Lagoon. Here are some ideas for day two: explore the striking landscape of Francois Peron National Park. For maps, other places to visit, ratings, and other tourist information, read Denham trip itinerary planning tool . Getting from Exmouth to Denham by car takes about 8 hours. Other options: do a combination of bus and car; or fly. Cap off your sightseeing on the 19th (Mon) early enough to go by car to Kalbarri. Kick off your visit on the 19th (Mon): get great views at Meanarra Hill Lookout, explore the wealth of natural beauty at Ross Graham Lookout, get great views at Hawk's Head Lookout, then explore the striking landscape at Eagle Gorge, then look for all kinds of wild species at Kalbarri Pelican Feeding, and finally see the vivid underwater world at Blue Holes. Here are some ideas for day two: take in the dramatic natural features at Zuytdorp Cliffs and then enjoy the sand and surf at Pot Alley Beach. To see ratings, traveler tips, other places to visit, and tourist information, refer to the Kalbarri trip maker site . Traveling by car from Denham to Kalbarri takes 5 hours. Alternatively, you can do a combination of shuttle and bus. Finish your sightseeing early on the 20th (Tue) so you can drive to Margaret River. Step out of the city life by going to Beedelup National Park and Bunker Bay. Explore hidden gems such as Eagles Heritage Wildlife Centre and Giants Cave. 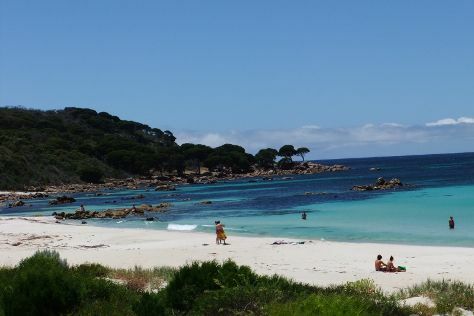 Get out of town with these interesting Margaret River side-trips: Cape Naturaliste (Sugarloaf Rock & Cape Naturaliste Walking Trails). There's still lots to do: enjoy the sand and surf at Margaret River Mouth Beach. For ratings, where to stay, and other tourist information, go to the Margaret River online trip planner . You can drive from Kalbarri to Margaret River in 9.5 hours. Alternatively, you can do a combination of bus and flight; or take a bus. Finish your sightseeing early on the 24th (Sat) so you can drive to Albany. Step off the beaten path and head to Bluff Knoll and Granite Skywalk. Visiting Elephant Rocks and Peaceful Bay will get you outdoors. Go for a jaunt from Albany to Denmark to see Moombaki Wines about 1h 15 min away. Spend the 26th (Mon) observing fascinating marine mammals with a dolphin and whale watching tour. It doesn't end there: explore the activities along Kalgan River. For traveler tips, where to stay, photos, and other tourist information, go to the Albany trip planner. Traveling by car from Margaret River to Albany takes 4.5 hours. Alternatively, you can take a bus; or do a combination of bus and flight. August in Albany sees daily highs of 19°C and lows of 7°C at night. Wrap up your sightseeing by early afternoon on the 27th (Tue) to allow time for travel back home.